1. 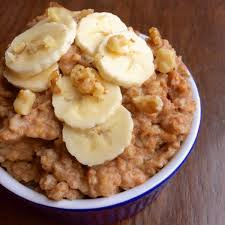 In medium sized slow cooker, combine milk, oats, bananas, walnuts, sugar (or Agave), cinnamon and salt. 2. Cook on LOW for 1-2 hours, or MEDIUM-HI for 1 hour. Stir occasionally, or until desired consistency. 3. You can serve it with yogurt, and you can also serve it with fresh berries on top.